Choosing a child's Halloween costume can be daunting, especially with all the costume choices these days! Whether you buy one from the store or you would like to make your own Halloween costume, there are a lot of options out there. So how do you help your child choose what to be? When brainstorming ideas, think about your child's interests and hobbies. Does he love to push his toy cars and trucks around? Or maybe your little girl adores her afternoon tea parties with her teddy bears. Whether it's dinosaurs, football or bugs, their interests provide a starting point to build their costume around. Car crazy – Use yellow duct or electrical tape to add the center dividing line for a road all over a black sweatshirt. Attach dollar store cars to the shirt/road. Tea party princess – Fake pearls, a fancy play hat and a lovely feather boa make a great fancy-pants outfit. Baseball fan – Wearing a baseball cap, a dark t-shirt with a number painted on the back and carrying a toy bat makes them the star player. Use your imagination ¦ or your child's for that matter! If your son is a dinosaur expert, ask him to choose three favorite creatures he might like to be for Halloween. Together, look them up on the Internet, then from the pictures envision the best plan of attack to make the costume. 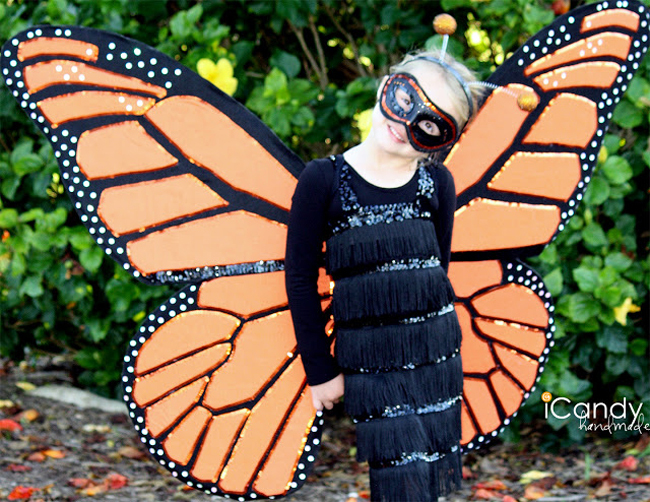 If your child loves butterflies, this beautiful Monarch butterfly costume might be just what you're looking for. Maybe your kids are the superhero type, in which case costumes can be as simple as a piece of fabric for the cape, a mask made from felt and a t-shirt with a painted or fabric logo glued on. If you sew, there are tons of patterns available online and in fabric stores. If you aren't much of a seamstress, or simply don't have a sewing machine available, hot glue works well on most fabrics. Not crazy about working with patterns and fabrics? There are other alternatives, such as cardboard and poster board. 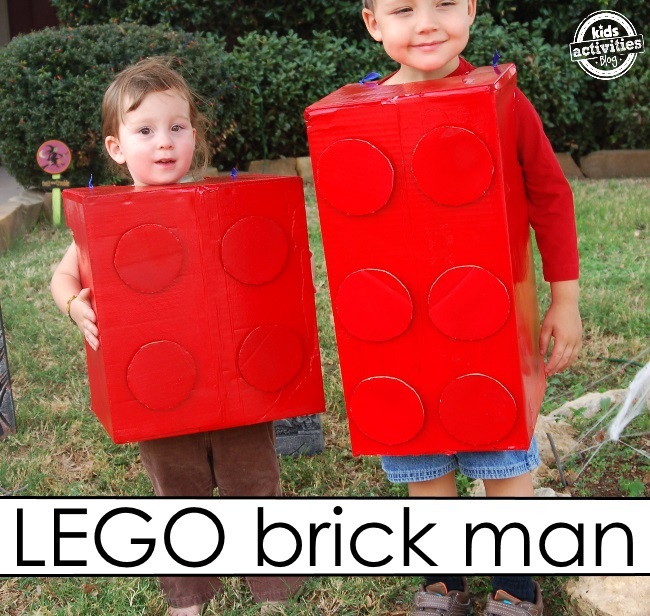 If your child is a Lego fan, they ™ll love this Lego costume made from a cardboard box and spray paint. There are plenty of costumes that can be put together from items around the house. For example, it's easy to create a chef's costume. Borrow one of Daddy's white button up shirts, make a chef's hat from white poster board, grab a wooden spoon, whisk and plastic mixing bowl, dust some flour on your child's face and they're ready to go. Maybe your child likes watching old monster movies with dad. If so, dress him us as a classic mummy. Take an old white bed sheet or other light colored fabric, cut or torn into long strips, and soak it in tea. Let the fabric get a bit tea stained then rinse, squeeze out the excess water and let dry. Wrap your child up in the fabric, use safety pins in various spots as you go to keep the bandages from unraveling. Little Taylor's room yells Princess from every corner. Help her bring that fantasy to life with a little creativity. Make a Princess hat from poster board or a sheet of craft foam and some tulle. Tape the end of some tulle to the poster board, then roll up the poster board into a cone shape. Trim the bottom edge of the cone so it is even, and decorate the rim with felt or lace. Use tape or a stapler (make sure the sharp end of the staple is on the outside of the hat) to attach a piece of elastic for a chin strap. Make a fancy skirt by sewing shiny fabric, then covering in complementary tulle (or raid the dress-up box). Finish with a pretty blouse, add some body glitter to her face, a touch of lip gloss and some simple homemade princess bracelets. 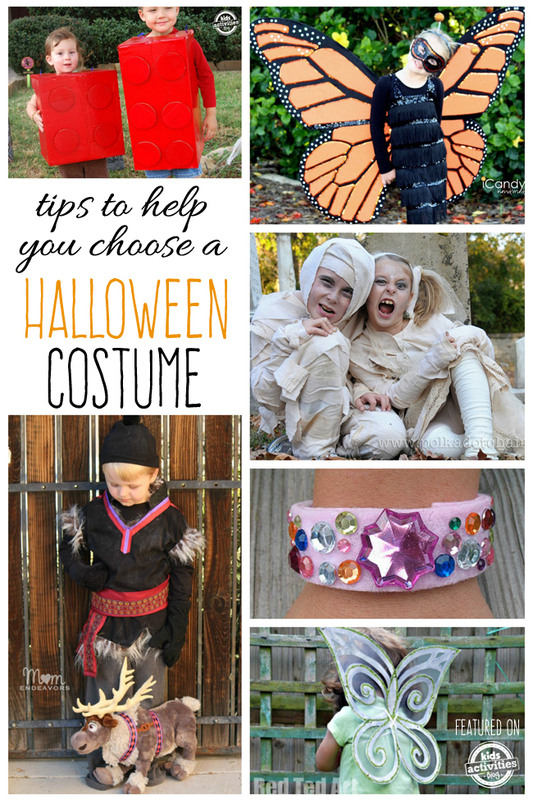 Don't wait until 3 days before Halloween to start looking for ideas! Sure, you ™ll find something, but chances are you will narrow down your choices dramatically. If you plan to make your own costume and it requires accessories or a certain fabric, you could find yourself out of luck. Remember, there are hundreds of other parents doing the same thing as you! Type in phrases such as DIY Halloween costumes  or Halloween costume ideas  into search engines and use the image  option for quick visual results. Go to Pinterest and search on costumes for kids  for some real Halloween overload! 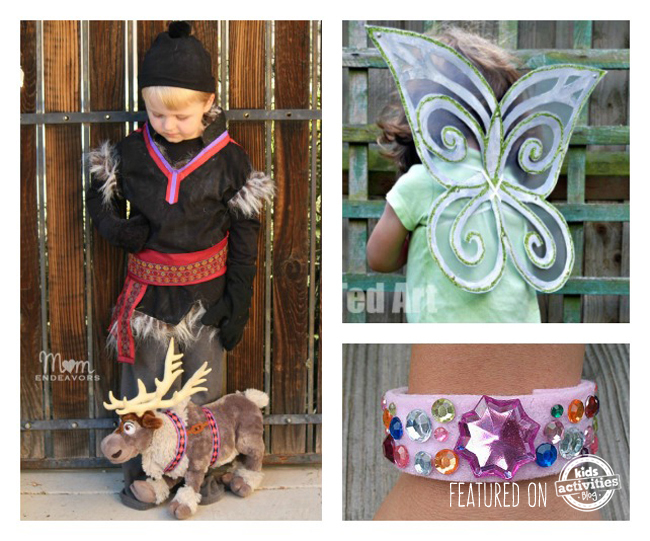 You ™ll find plenty of ideas from popular movies, like these Frozen costume ideas or collections of specific types like these no-sew costume options. You ™ll find costumes from the simple to the elaborate and everything in between. Halloween is a fun time of year, but chances are your child will wear that costume once. Maybe you have younger kids that you can pass it down to, or perhaps they ™ll use it for dress up fun. But, more than likely they ™ll wear it for a Halloween party and for trick-or-treating and never touch it again. So don't stress yourself out about it and worry about it being perfect, your child will love whatever you buy or make for them. Keep it simple and do whatever makes you and your child happy. If that means buying a costume then so be it. If you love to create, then by all means make one! Whatever makes the two of you smile together. So what are you waiting for? Sit down with your kids and put your heads together to come up with a fun Halloween costume idea you both will truly enjoy.